This week the program CQFD on RTS has scheduled a detailed discussion on project AlpArray. You can listen to the interview by Silvio Dolzan with György Hetényi here. 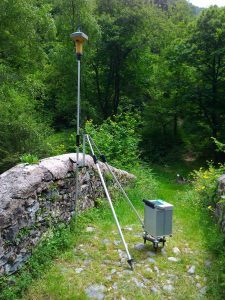 In the first weeks of June a combined gravity and seismology field campaign was lead by Matteo Scarponi in the Ivrea-Verbano zone, helped by a changing team for new energy input. The environmental conditions were demanding: heat, thunderstorm, rain, hale, fog, snakes, scorpions, ticks, landslide, fallen tree, and other “surprises”. Luckily we’ve also met helpful people, could do a few key measurements during short hikes, and seen nice landscapes.